At the BTBA party last month I wanted to try wearing my tobacco-linen jacket separately. 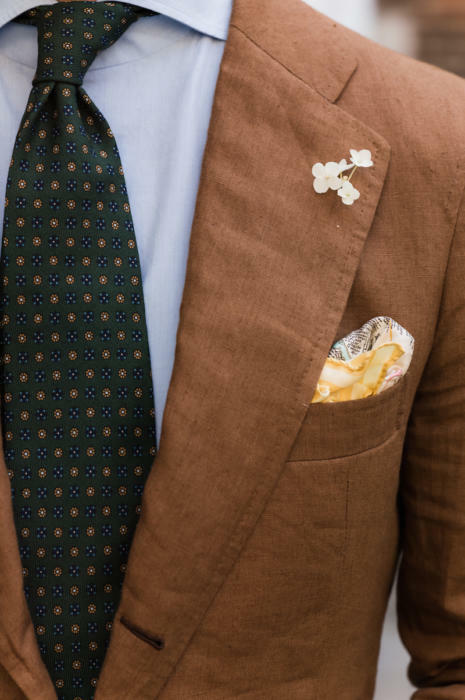 It is part of a suit of course, but it was commissioned from Sastreria Langa in Madrid with a ‘shirt’ sleeve and patch pockets to make it casual enough to wear on its own. So first thing picked: the jacket. Next, on to the trousers. Although the linen (from Scabal) is a strong colour it is also a mid-tone, neither that light or that dark. As a result, it requires trousers that are rather light or dark, to achieve enough contrast. Linen was also discounted: as in most situations, the same material would have looked odd as both odd jacket and odd trouser. I tried tan cotton, pale-grey fresco and cream gabardine. 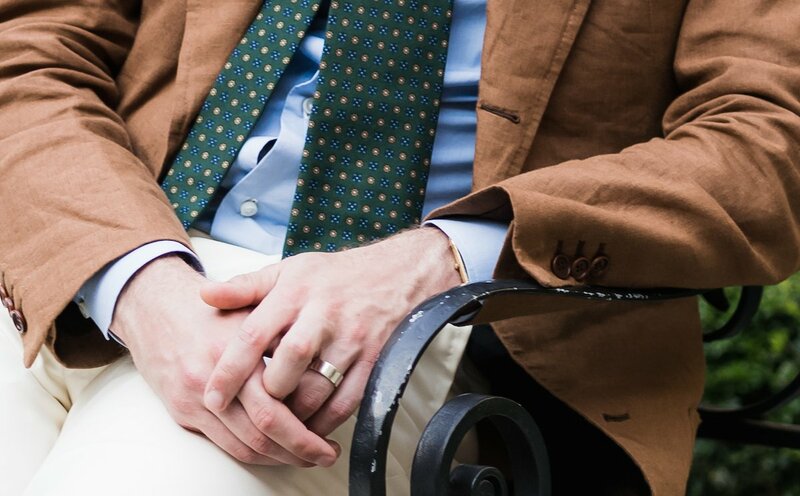 The latter two both worked (tan was too similar in tone) but cream gabardine was selected purely on the basis that these lovely Anderson & Sheppard trousers don’t get worn very much. Gabardine is pretty formal, cream particularly, and so they rarely get worn to the office. 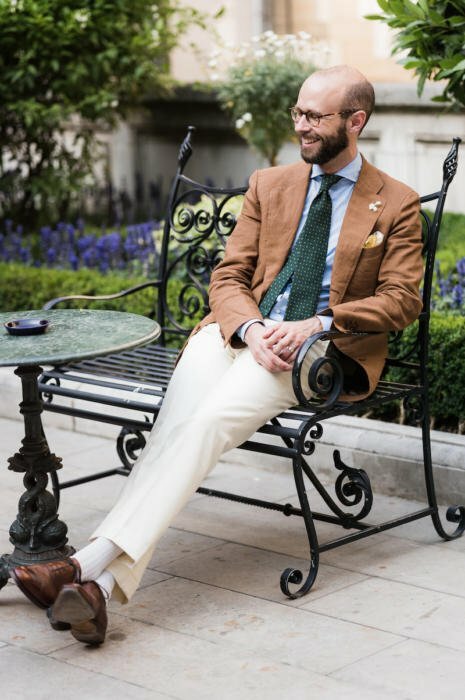 Blue shirt (white hard to differentiate from the trousers); cream socks (always match the trousers be default – and this didn’t need any more colour); tan Stefano Bemer oxfords (the default for cream trousers unless you like spectators, which I don’t). The yellow silk handkerchief, from Rubinacci, performed a supporting role despite its relatively strong colour. Another silk would have competed too much with the jacket and tie, making the whole outfit too colourful and a little top-heavy. This yellow, with some cream in the pattern, feels like it is echoing the trousers rather than trying to make its own statement. I have the opposite opinion of boutonnieres: they can be much stronger or unusual in colour because of their usually small size. Here I chose a simple white flower, but a pink or purple might have worked where it would have been too much as a handkerchief. More on that in another post. Overall, a relatively simple outfit, but a satisfying match to the event and use of the tobacco linen. You can follow the discussion on Wearing colour: Tobacco jacket and cream trousers by entering your email address in the box below. You will then receive an email every time a new comment is added. These will also contain a link to a page where you can stop the alerts, and remove all of your related data from the site. Wonderful. I love tobacco lightweights for summer. Dark brown suede loafers could make a nice alternative for this rig, and bring perhaps even more informality to it. Hi Simon….notice that you are still using Graham Browne, albeit for modifications/alternations; I assume that whilst you have experienced the likes of Cifonelli, Chittelborough and Camps De Luca, that you still rate GB highly, or is that only in the alternation space? I still think they are fantastic value for what they do, yes. Anywhere else you’d be paying £1500 for a bespoke-cut suit like that. I don’t use them much for final suits any more, but they have been brilliant for alterations yes. I salute your eye for colours, Simon. Though Printed wool tie in the summer? As gorgeous as that tie is, i’d have gone for a knit or a club/rep stripe. Regarding the trousers, are they wool or cotton based? Firstly I would like to say how great these how to wear colour/choose an outfit articles are – as interesting as your pieces on different bespoke makers are, they don’t serve as much practical purpose for someone like myself (still at university and can’t afford bespoke!). So please keep this series coming. Secondly, are the A&S trousers bespoke or are they from the haberdashery? what fabric would you advise for casual shirts to be worn with chinos and odd jackets? I was thinking about oxford cotton with bd collars. Simon my good man, a most dashing outfit this is. The tobacco color is splendid and it seems such a color would go with many a colors for trousers. 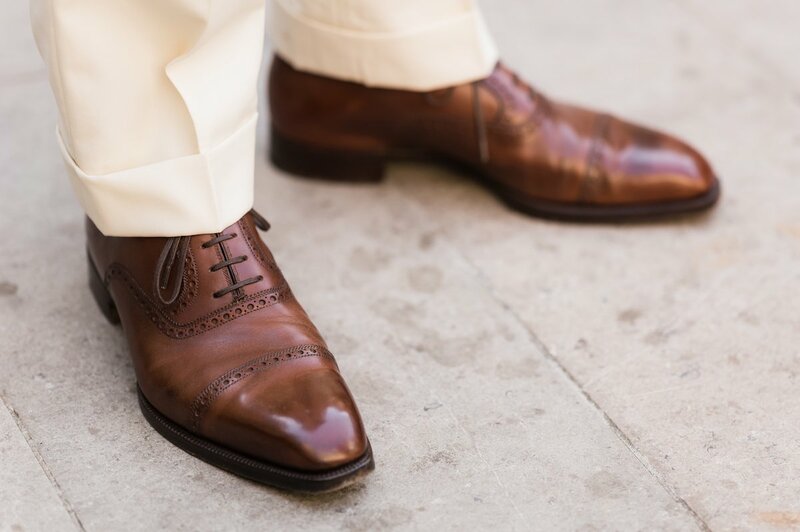 Hi Simon,have you ever considerd wearing low heeled Gucci styled moccasins with an outfit like this or even with a cotton suit?As an example, Luca Rubinacci carries off this look with aplomb albeit with Rubinacci’s Marphy shoes.Sometimes,traditional Oxfords or even Goodyear welted loafers feel to formal on some occasions. Simon, I agree that the linen’s a lovely colour, though I think the 8oz weight is maybe too crease-prone for a smart event (as shown in the original post). I also find it too casual in it’s make for a dressy occasion. This reminds me of your Neapolitan items. That said, it was blisteringly hot that day, you looked great and you wore a tie (thankyou!). We must also allow for the usual fact that nothing looks its best in photos. Thanks for this post dedicated to “exercise in style”! It very very useful to many of us. That said, I’m impressed by how you have managed to pull off all these items. The whole outfit suited very well to the kind of event you attended. I think it’s important to keep this in mind. But there’s one item for which I would have either broken a rule or change the color of another item to feel really good: the color of your socks! Matching socks and trousers to me is mostly workable when one wears a suit of dark color (from charcoal and midnight navy to , say, mid-grey). So for a smart casual outfit such as the one you are wearing, I would rather pull off either navy blue, or dark green or even dark Brown socks instead. Yet such a bold choice would then lead me to “compromise”, as it were, as to the color of the tie. Then I wouldn’t stray too far away from the color of the jacket: just a shade lighter or stronger. But since I love the overall effect of this green tie too, I think I would have gone for dark brown socks! Yes, it may sound a bit strange, but I simply can’t match cream trousers with cream socks! No matter how much I have read Alan Flusser or Will Boehlke or anyone else in the know, I simply … can’t! Blue and green is becoming quite the thing. I don’t like the colour of the jacket but that is just personal preference. Not sure about the cream socks – I would have thought light coloured but maybe a stripe or subtle pattern in light blue or green?? Nice cuffs. See a lot of cream/white trousers in old photos/illustrations & love the idea but think you have to be brave to wear as never see any around these parts (SE Australia). I have just noticed the swelled edge on the coat. Nice touch. More informality. Very nice outfit Simon. How do you keep those cream trousers clean? Between the tube and the other general London grime, I find just maintaining khaki chinos tricky. I don’t wear them very often… And then I’m really careful! Simon, your outfit absolutely nails it, as usual. I sense some Bruce Boyer influence, which is always welcome. And the shoes are nothing short of spectacular! Good combination. But, with the due respect, the only person entitled to wear socks of that colour without offense for elegance, died. Was Francis Scott Fitzgerald. If I can, without seeming annoying, I’d recommend this combination with loafers and no socks or blue-similar-to-tie ones. Ah, when I say loafers, I do mean something like Cleverley Forte or Rothschild, in mahogany or ox blood..
Verry nice ensemble. I wonder about the boutennier. They are hard to find nowadays. Can you give me more info where you bought yours. Kind regards. It’s just a fresh flower from the Hall gardens.